Everyone should have their own opinion and be able to voice it. No matter what it is. 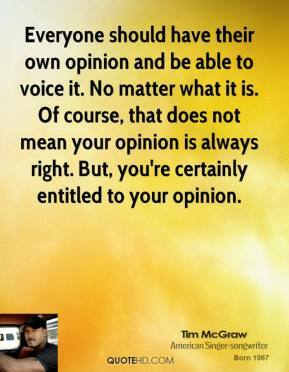 Of course, that does not mean your opinion is always right. But, you're certainly entitled to your opinion. 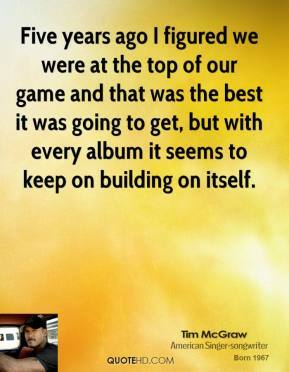 Five years ago I figured we were at the top of our game and that was the best it was going to get, but with every album it seems to keep on building on itself. 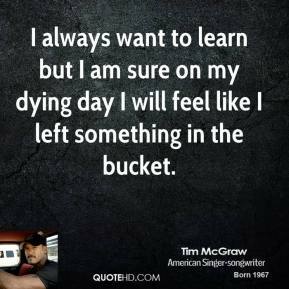 I always want to learn but I am sure on my dying day I will feel like I left something in the bucket. I coach my daughter's softball and basketball team. We go to all the school functions. 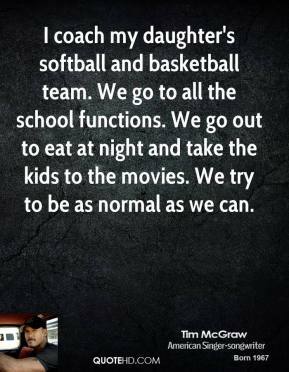 We go out to eat at night and take the kids to the movies. We try to be as normal as we can. I didn't want to play a rancher. 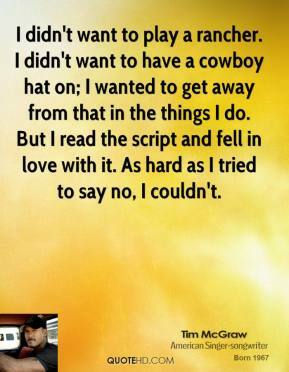 I didn't want to have a cowboy hat on; I wanted to get away from that in the things I do. But I read the script and fell in love with it. As hard as I tried to say no, I couldn't. 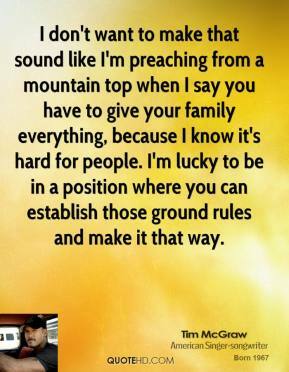 I don't want to make that sound like I'm preaching from a mountain top when I say you have to give your family everything, because I know it's hard for people. I'm lucky to be in a position where you can establish those ground rules and make it that way. 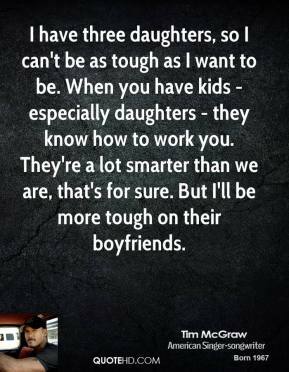 I have three daughters, so I can't be as tough as I want to be. When you have kids - especially daughters - they know how to work you. They're a lot smarter than we are, that's for sure. But I'll be more tough on their boyfriends. I like the values in Flicka, and I wanted to do a movie my kids could see and be proud of. I live in a house with four women. Just shut up and say, Yes, ma'am. 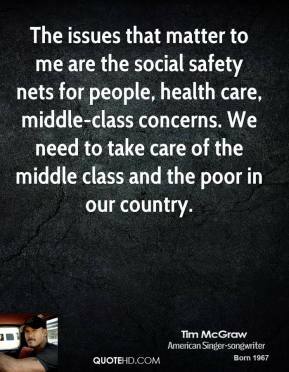 I love Bill Clinton. I think we should make him king. 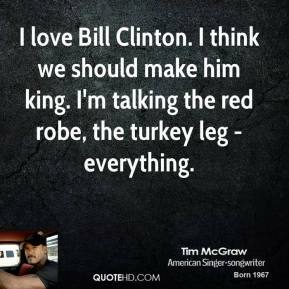 I'm talking the red robe, the turkey leg - everything. I love producing. 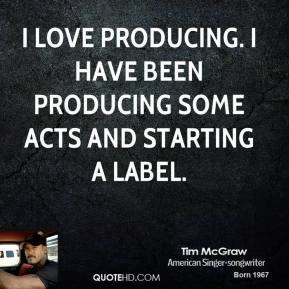 I have been producing some acts and starting a label. I mean, I grew up riding. I can't ever remember not being able to ride or rope and all that stuff. It was part of my life growing up, so it was fun for me. 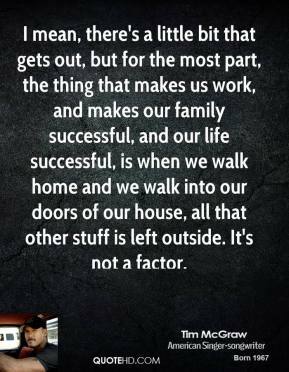 I mean, there's a little bit that gets out, but for the most part, the thing that makes us work, and makes our family successful, and our life successful, is when we walk home and we walk into our doors of our house, all that other stuff is left outside. It's not a factor. I think you have to be a little bit strict. 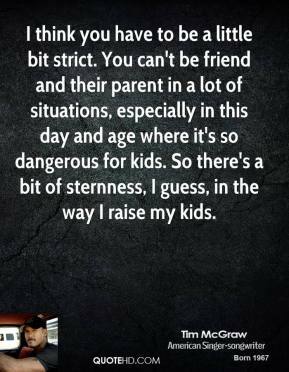 You can't be friend and their parent in a lot of situations, especially in this day and age where it's so dangerous for kids. So there's a bit of sternness, I guess, in the way I raise my kids. I want to run for the Senate from Tennessee. Not now, but when I'm 50, when music dies down a little bit. 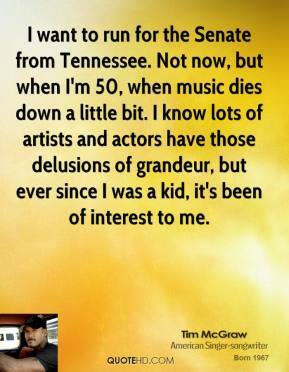 I know lots of artists and actors have those delusions of grandeur, but ever since I was a kid, it's been of interest to me. I'm a private guy, and you don't want to be out there preaching to people. But faith leads you in the decisions you make. 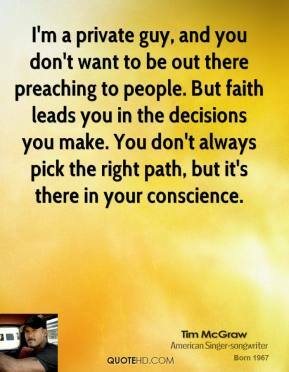 You don't always pick the right path, but it's there in your conscience. I'm actually not an exhibitionist at all. 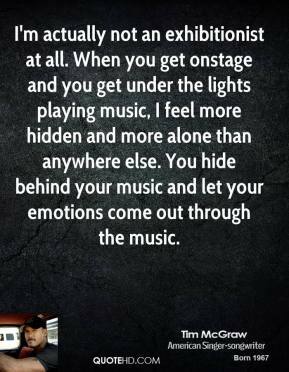 When you get onstage and you get under the lights playing music, I feel more hidden and more alone than anywhere else. You hide behind your music and let your emotions come out through the music. 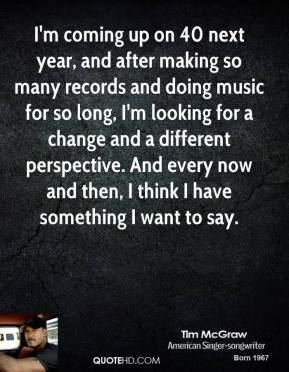 I'm coming up on 40 next year, and after making so many records and doing music for so long, I'm looking for a change and a different perspective. And every now and then, I think I have something I want to say. 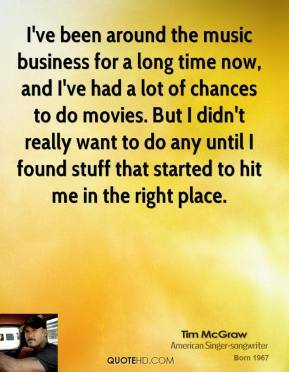 I've been around the music business for a long time now, and I've had a lot of chances to do movies. But I didn't really want to do any until I found stuff that started to hit me in the right place. No, there will come a time where I'm not gonna do this anymore. 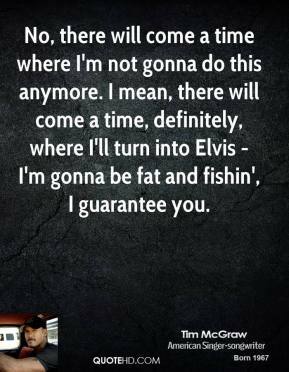 I mean, there will come a time, definitely, where I'll turn into Elvis - I'm gonna be fat and fishin', I guarantee you. 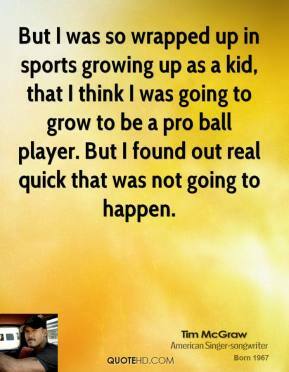 But I was so wrapped up in sports growing up as a kid, that I think I was going to grow to be a pro ball player. But I found out real quick that was not going to happen. 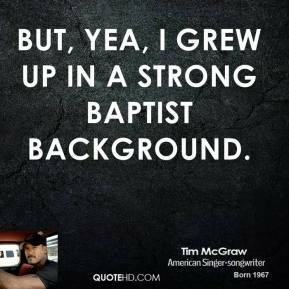 But, yea, I grew up in a strong Baptist background. 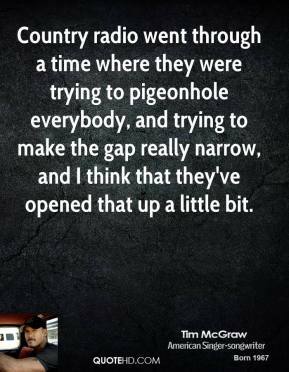 Country radio went through a time where they were trying to pigeonhole everybody, and trying to make the gap really narrow, and I think that they've opened that up a little bit. The last movie I did, I was very lucky: I got to work with probably the best actor of our era, Billy Bob Thornton. He's just incredible. I was like a sponge: I soaked up everything he had to say.